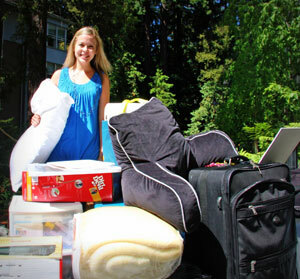 Freshman Heather Snijdewind was moving in her essential gear at College Ten Friday. 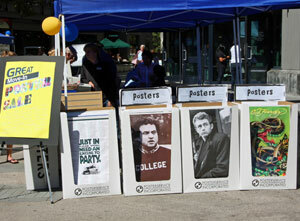 Bay Tree Plaza bustled with booths offering information and goods for new students. When Alex Oswalt saw UC Santa Cruz, he fell in love with it. So the 17-year-old freshman from Orangevale was pretty happy to be moving into his dorm Thursday morning, the first day of this year's "move-in" weekend at UCSC. "It feels great," said the tall, dark-haired Oswalt, sitting at his desk in his dorm room at Merrill College while his parents checked out his new home and busily helped him unpack. "I'm a little nervous, though. I haven't met my roommate yet." His parents, Patrick and Grace Oswalt, admitted to being a little nervous, too. Alex is their first child going off to college. "We're not sure how we're going to react," said Grace, while making Alex's bed with navy blue sheets. "But we're happy for him. He likes Santa Cruz a whole lot." Apart from his studies--he plans to major in computer game design--Alex said he's most interested in making some new friends. His parents planned on buying a few things he needed that afternoon, then taking off and letting their son get settled. "I remember when I went to college, and it was really exciting," said his mom. "So I'm pretty sure he feels the same way. It's a new world." For mom RayDelle Kistler of Turlock, letting go was tough this year, even though she did it once already last year. Her daughter, sophomore Grace Kistler-Fair, 19, was moving into a new dorm room at Merrill that's larger than her freshman room. "This year was harder," said RayDelle, fighting back tears. "When she came home for the summer, I had so many things I wanted to do, and there wasn't enough time." Grace's dad, Mike Fair, looked on, amused. "I'm good with it," he said with a smile, adding that both parents are extremely proud of their daughter, who they said is an "A" student and had won scholarships. UCSC was Grace's first choice for college. "I love the campus," said Grace, who wore a purple T-shirt, jeans, and black Vans. "It's beautiful. In Santa Cruz, there are the mountains, the forest, and the beach. The people are great, the classes are great, the teachers are amazing." Her parents having taken a break and wandered outside, Grace got back to work unpacking the stuff essential to college life: school supplies, a printer, food for the mini-fridge, posters, T-shirts and jeans, a whiteboard for friends to write funny messages on, a guitar, and a ukulele. 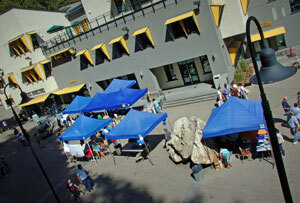 An estimated 4,150 new undergraduate students will start classes for the 2009-10 academic year on Thursday. For more facts and figures about this year's new students and the campus, see UC Santa Cruz prepares to open for 45th new class.